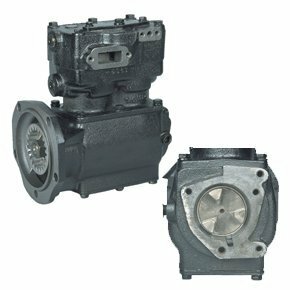 Genuine Haldex Midland EL1300 DDC Compressor EL13053X. OEM NT7005AK Exact Replacement. Core Group 1353. Right Head Rotatable, Left Block Rotation, Flange Mount, Gear Drive, Top/Threaded Discharge Type, End Cap Oil Feed, Oil Drain Internal at Flange, Water Cooled. * Orientation viewed from front. * Changeover/Installation Instructions: L31106. * Service units are furnished without governors and manifolds and may require head rotation and end cap rotation before installation or changeover. * Thru-drive units must not exceed 65 ft. lbs. of transmitted torque.